One of the families traditionally placed within the Rhodophyta is the Solenoporaceae. 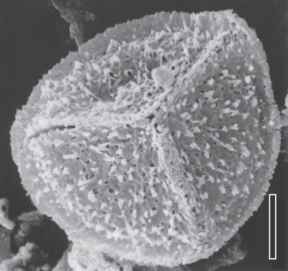 Although several genera were initially assigned to the animal kingdom (e.g., as tabulate corals, bryozoans, or sponges; see Cozar and Vachard, 2006), solenoporaceans were later generally interpreted as calcified red algae (Pia, 1927) (FIG. 4.45). Today, however, the Solenoporaceae is known to represent a heterogeneous group that includes a variety of animals, red algae, and cyanobacteria, and, as a result, it is no longer possible to support the concept of the Solenoporaceae (Ordovician-Miocene) as a coherent family (Riding, 2001). indicates that the initial interpretation was accurate and thus removes Solenopora from the algae (Riding, 2004). 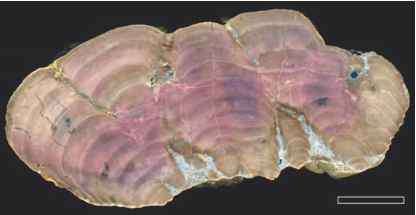 Another form initially placed in Solenopora is S. gotlandica from the Silurian of Sweden and Wales. This species, which represents a true red alga, was transferred to the genus Graticula (Brooke and Riding, 1998, 2000). Skeletons of G. gotlandica (FIGS. 4.49, 4.50) may be free nodular or massive encrusting and are composed of laterally joined columns, branches, or pillars, which are mushroom- or umbrella-like, and occasionally up to 10 cm high (Nose et al., 2006). The columns consist of erect-to-radiating, juxtaposed filaments, which are rounded to polygonal or irregular in cross section, and which share adjacent walls; cross partitions (cross walls) in adjacent filaments are sometimes aligned. The arrangement of cross partitions, along with the presence of sporangia in sporangial compartments arranged in irregular sori, separates Graticula from other forms traditionally placed in the Solenoporaceae. Based on these features, Brooke and Riding (1998, 2000) established the new family Graticulaceae, which they assign to the Corallinales. The Paleozoic Graticulaceae are structurally similar to the Sporolithaceae (Corallinales); the type species G. gotlandica closely resembles members in the earliest recorded modern Corallinales, whose fossil record only extends back into the Early Cretaceous (Braga and Bassi, 2007; Tomás et al., 2007).